Pythagoras is often referred to as the first pure mathematician. He was born on the island of Samos, Greece in 569 BC. Various writings place his death between 500 BC and 475 BC in Metapontum, Lucania, Italy. His father, Mnesarchus, was a gem merchant. His mother's name was Pythais. Pythagoras had two or three brothers. Some historians say that Pythagoras was married to a woman named Theano and had a daughter Damo, and a son named Telauges, who succeeded Pythagoras as a teacher and possibly taught Empedocles. Others say that Theano was one of his students, not his wife, and say that Pythagoras never married and had no children. Pythagoras was well educated, and he played the lyre throughout his lifetime, knew poetry and recited Homer. He was interested in mathematics, philosophy, astronomy and music, and was greatly influenced by Pherekydes (philosophy), Thales (mathematics and astronomy) and Anaximander (philosophy, geometry). Pythagoras left Samos for Egypt in about 535 B.C. to study with the priests in the temples. Many of the practices of the society he created later in Italy can be traced to the beliefs of Egyptian priests, such as the codes of secrecy, striving for purity, and refusal to eat beans or to wear animal skins as clothing. Ten years later, when Persia invaded Egypt, Pythagoras was taken prisoner and sent to Babylon (in what is now Iraq), where he met the Magoi, priests who taught him sacred rites. Iamblichus (250-330 AD), a Syrian philosopher, wrote about Pythagoras, "He also reached the acme of perfection in arithmetic and music and the other mathematical sciences taught by the Babylonians..."
All things are numbers. Mathematics is the basis for everything, and geometry is the highest form of mathematical studies. The physical world can understood through mathematics. The soul resides in the brain, and is immortal. It moves from one being to another, sometimes from a human into an animal, through a series of reincarnations called transmigration until it becomes pure. Pythagoras believed that both mathematics and music could purify. Numbers have personalities, characteristics, strengths and weaknesses. The world depends upon the interaction of opposites, such as male and female, lightness and darkness, warm and cold, dry and moist, light and heavy, fast and slow. Certain symbols have a mystical significance. All members of the society should observe strict loyalty and secrecy. The theorem of Pythagoras - for a right-angled triangle the square on the hypotenuse is equal to the sum of the squares on the other two sides. The Babylonians understood this 1000 years earlier, but Pythagoras proved it. Constructing figures of a given area and geometrical algebra. For example they solved various equations by geometrical means. The discovery of irrational numbers is attributed to the Pythagoreans, but seems unlikely to have been the idea of Pythagoras because it does not align with his philosophy the all things are numbers, since number to him meant the ratio of two whole numbers. The five regular solids (tetrahedron, cube, octahedron, icosahedron, dodecahedron). It is believed that Pythagoras knew how to construct the first three but not last two. 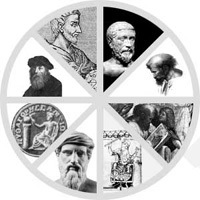 Pythagoras taught that Earth was a sphere in the center of the Kosmos (Universe), that the planets, stars, and the universe were spherical because the sphere was the most perfect solid figure. He also taught that the paths of the planets were circular. Pythagoras recognized that the morning star was the same as the evening star, Venus. 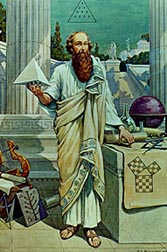 Pythagoras studied odd and even numbers, triangular numbers, and perfect numbers. Pythagoreans contributed to our understanding of angles, triangles, areas, proportion, polygons, and polyhedra. Pythagoras also related music to mathematics. He had long played the seven string lyre, and learned how harmonious the vibrating strings sounded when the lengths of the strings were proportional to whole numbers, such as 2:1, 3:2, 4:3. Pythagoreans also realized that this knowledge could be applied to other musical instruments. The reports of Pythagoras' death are varied. He is said to have been killed by an angry mob, to have been caught up in a war between the Agrigentum and the Syracusans and killed by the Syracusans, or been burned out of his school in Crotona and then went to Metapontum where he starved himself to death. At least two of the stories include a scene where Pythagoras refuses to trample a crop of bean plants in order to escape, and because of this, he is caught. The Pythagorean Theorem is a cornerstone of mathematics, and continues to be so interesting to mathematicians that there are more than 400 different proofs of the theorem, including an original proof by President Garfield.